By keeping your car for 200,000 miles or more, you can save the money of buying a new car. Plus: Cars that can outlast all the rest. NEW YORK (CNNMoney.com) -- By keeping your car for 15 years, or 225,000 miles of driving, you could save nearly $31,000, according to Consumer Reports magazine. That's compared to the cost of buying an identical model every five years, which is roughly the rate at which most car owners trade in their vehicles. In its annual national auto survey, the magazine found 6,769 readers who had logged more than 200,000 miles on their cars. Their cars included a 1990 Lexus LS400 with 332,000 miles and a 1994 Ford Ranger pick-up that had gone 488,000 miles. 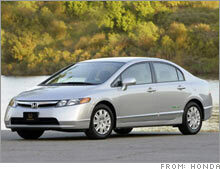 Consumer Reports calls the Honda Civic a "Good bet" to make it to 200,000 miles. Calculating the costs involved in buying a new Honda Civic EX every five years for 15 years - including depreciation, taxes, fees and insurance - the magazine estimated it would cost $20,500 more than it would have cost to simply maintain one car for the same period. Added to that, the magazine factored in $10,300 in interest that could have been earned on that money, assuming a five percent interest rate and a three percent inflation rate, over that time. The magazine found similar savings with other models. To have much hope of making it to 200,000 miles, a car has to be well maintained, of course. The magazine recommends several steps to help your car see it through. Follow the maintenance guide in your owner's manual and make needed repairs promptly. Use only the recommended types of fluids, including oil and transmission fluids. Check under the hood regularly. Listen for strange sounds, sniff for odd smells and look for fraying or bulges in pipes or belts. Also, get a vehicle service manual. They're available at most auto parts stores or your dealership. Clean the car carefully inside and out. This not only helps the car's appearance but can prevent premature rust. Vacuuming the inside also prevents premature carpet wear from sand and grit. Buy a safe, reliable car. Buying a car with the latest safety equipment makes it more likely you'll feel as safe in your aging car as a newer model. The magazine recommends several cars that have the best shot at reaching the 200,000 mile mark and a few that, according to its data, aren't likely to make it. All the cars in the magazine's "Good bets" list are manufactured by Honda (Charts) and Toyota (Charts). (One extreme example was not enough to get the Ford Ranger onto the list.) The "Bad bets" are a mixture of European models and two Nissans. Consumer Reports' "Bad bets" for making 200,000 miles: BMW 7-series, Infiniti QX56, Jaguar X-type, V8-powered Mercedes-Benz M-class, Mercedes-Benz SL, Nissan Armada, Nissan Titan, Volkswagen Touareg, V6-powered Volvo XC90.